HUAMA, Cuzco, Peru, May 16 2008 (IPS) - In South America’s Andes mountain region, indigenous women have traditionally been responsible for selecting, conserving and managing seed potatoes from the countless native varieties of the crop, thus ensuring diversity and continued production while contributing to food security among their people. Huama villagers harvesting potatoes. Credit: Milagros Salazar/IPS. The conservation of thousands of native varieties of the potato (Solanum tuberosum), each with its own unique taste, nutritional value and climate-resistant traits, has taken on greater importance than ever this year. One of the reasons behind the current global food crisis is that human survival is currently dependent on just a handful of plant species, experts warn. Surrounded by a group of men, Natividad Pilco, a 44-year-old Peruvian woman, digs into the soil with the zeal of someone seeking buried treasure. And she finds it. “This potato is called ‘oke suito’ (long bluish potato) and it’s good for boiling. This one here is ‘yana bole’ (round black potato) and it’s used in soups because it’s sweet,” she explains. Pilca is a member of a group of 40 families dedicated to the conservation of native potato varieties in the highlands community of Huama, located more than 4,000 metres above sea level and a two-hour drive from the city of Cuzco in southern Peru. It is now the harvest season, when the women of Huama accompany their husbands to the fields to help pick potatoes and to select the best ones for feeding their families. “Chuño” is prepared with a traditional method of preserving and storing potatoes for long periods of time. First the women freeze the potatoes overnight in the intense cold of the Andean highlands. Then they dehydrate them by squashing them flat and laying them out on the roofs of their houses to dry in the sun. Women are responsible for the continued preparation of traditional dishes like this in the kitchen, but their role in the potato production process begins in the fields. It is women who select the potatoes that will be used as seeds for future crops, a task that is essential to ensuring the continued diversity of potato varieties. They also participate in the actual planting, and in managing the stocks of harvested and stored potatoes. “We help with the planting by selecting the seed potatoes, bringing the fertiliser, sowing the seeds and covering them with soil,” said peasant farmer Regina Illamarca, who was working with her young son slung over her back in a colourful poncho. In the Andes, the entire family is involved in raising crops. 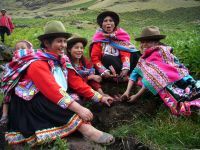 In some Andean highland communities in southern Peru, like Ccaritamaya in Puno, only women can place the seed potatoes in the furrows, the heads of that village explained in a survey conducted by the United Nations Food and Agriculture Organisation (FAO). For centuries, women have been traditionally associated with the planting of seeds and growing of crops in rural areas. Researchers Mario Tapia and Ana de la Torre point out in their book “La mujer campesina y las semillas andinas” (Peasant Women and Seeds in the Andes) that the deities in this region’s culture are largely female. The supreme deity is Pachamama, or “Mother Earth” in the Quechua indigenous language. Women also actively participate in the rituals performed to guarantee successful harvests. In Ccaritamaya, women of child-bearing age use incense to act out a symbolic first sowing as an offering to Pachamama. The engravings by Peruvian historian Felipe Guamán Poma de Ayala, dating back to the era of the Spanish “conquest”, show women placing seed potatoes and corn kernels in the soil at the height of the planting season. In their book, Tapia and de la Torre compare the home, where women take care of seeds and the food that is harvested, with the womb. “In Andean (indigenous) thinking, men deposit the seed, and women receive it (whether in the womb or the home), store it and care for it. In other words, they are responsible for it until it leaves their domain once again, to be planted in the fields,” they recount. FAO reports that women have been responsible for selecting countless varieties of potatoes to preserve and enhance crop diversity, which has made it possible to plant them in different agro-ecological regions and to withstand pests, diseases and climate change. Tapia and de la Torre note that there have even been cases discovered where the oldest women in the communities are in charge of breeding new varieties of potatoes to increase diversity and make it possible to select the best strains for planting. For this same purpose, “seed fairs” are held in the Andes, where women play a vital role in sharing and exchanging different varieties. Prepared in an endless range of forms, the potato has been incorporated into the culinary traditions of almost every region on the planet. It is the fourth most important human staple food, after corn, wheat and rice. More than 323 million tons of potatoes are produced annually around the world. As well as being packed with vitamins, minerals and carbohydrates, the potato is also the most protein-rich tuber, according to FAO. Although scientists working in laboratories use their own techniques to preserve the potato, “the conservation work done by these peasant farmers is much more important, because they maintain diversity in a living and dynamic form,” said María Scurrah, a geneticist at the non-governmental International Potato Centre (CIP). The CIP, based in Lima, houses a potato germplasm bank that contains seeds, tissue cultures and plants representing close to 4,500 varieties of potato from the Andean region, over half of which are native to Peru. “Our women are important in the fields, in the harvest, in the selection of seed potatoes, and in business. If I come to work the land, I have to coordinate everything with my wife,” stressed the president of the conservationists in Huama, Rafael Pilco. The business savvy of these peasant women is recognised by the entire community. In Huama, over the last three years, they have been responsible for selling 20,000 kilos of native potatoes to two of the top hotels in Cuzco. Although an agreement signed with the hotel chains establishes that each kilo of potatoes is bought for barely half a dollar, the women insist that they always try to get the best price possible. “The men don’t know how to sell, they’ll give up the potatoes for next to nothing,” exclaimed Illamarca, with an accusatory glance at her husband, Narciso Tilca. The relationship between indigenous highlands women and this food staple is also linked to social status. The more a peasant woman knows about the culinary preparation, diversity and conservation of potatoes, the greater her prestige in the community. As a result, it is common for mothers-in-law to put the cooking skills of their daughters-in-law to the test by getting them to peel potatoes with tricky shapes. Tapia emphasized that peasant women need support and especially information about the need to offer their families varied and nutritious food, so that the ancestral knowledge passed down through generations is enhanced by modern approaches.